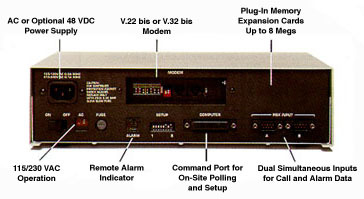 Computer Port: RS-232 DCE, DB-25 Female (Modem Style). Standard rates from 300 to 38.4K bps (Can also be used as external modem port). PBX Ports: Two (2) RS-232 DTE, DB-9 Male (AT PC Style.) Standard rates from 300 to 38.4K bps for each port. XON/XOFF flow control. All parameters programmable. Storage Capacity: Based on AT&T 80 character format, using dual compression. Call record capacity may vary with other PBX formats. Network Interface Card: Ethernet, 10Base-T, 16-bit ISA bus plug-in card. Programmable IP Address, Subnet Mask, and Gateway Address. Modem Port: RJ-11 Jack to Telephone Line. All standard rates from 300 bps to 115.2 Kbps. 7 or 8 data bits; even, odd or no parity; 1 or 2 stop bits. XON/XOFF, RTS/CTS, both, or no flow control. User defined modem reset string, initialization string, and hang-up string. All parameters programmable. Console Port: RS-232, DCE, DB-25 Female (Modem Style). All standard rates from 300 bps to 115.2 Kbps. 7 or 8 data bits; even, odd or no parity; 1 or 2 stop bits. XON/XOFF, RTS/CTS, or no flow control. All parameters programmable. PBX Ports: (3) RS-232, DTE, DB-9 Male. All standard rates from 300 bps to 115.2 Kbps for each port. Buffered, Bidirectional. 7 or 8 data bits; even, odd or no parity; 1 or 2 stop bits. XON/XOFF, RTS/CTS, or no flow control. All parameters programmable.